The pakhawaja mridang is an Indian barrel-shaped, two-headed drum a variant and descendant of the older mridang. It is the standard percussion instrument in the dhrupada style and is widely used as an accompaniment for various forms of music and dance performances. The pakhavaja has a low, mellow tone, very rich in harmonics. Set horizontally on a cushion in front of the drummer's crossed leg, the larger bass-skin is played with the left hand, the treble skin by the right hand. The bass face is smeared with wet wheat dough which acts as the kiran and is the cause of the vivid, bass sound the pakhavaja produces.The word pakhāvaja or pakhavāja is of Prakrit origin, whose Sanskrit equivalent is pakṣavādya. 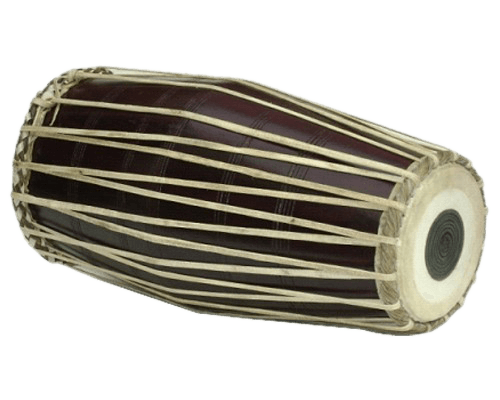 This instrument is always known as pakhavaj and not pakshavadya.